The Education Enterprises team promotes the understanding of science and engineering both within the Museum through temporary and traveling exhibits, and throughout the Museum community by collaborating on projects and providing services, consultation, and products. Products include traveling exhibits, the duplication of interactive exhibits, and the licensing of program materials, public presentations, and Planetarium shows. In addition to products outlined below, we are available to discuss the purchase or duplication of any other permanent exhibits developed by our team of experts. All exhibits at the Museum of Science go through extensive prototyping and evaluation during the development phase, and — with more than 1.5 million visitors annually — have undergone rigorous testing in our own Exhibit Halls. Contact us if you would like to be added to our mailing list for more information on these new opportunities. Our newest touring exhibition, The Science Behind Pixar , explores how Pixar Animation Studios combines science, technology, engineering, and math with art to create some of the world's most popular animated films. This 12,000-square-foot interactive, hands-on exhibit is currently touring two copies—one nationally, and internationally. To date, we have had incredible interest in this project and we now have limited tour availability beginning in 2023. Contact us for information regarding hosting The Science Behind Pixar at your institution. Check back for new exhibit offerings, or contact us if you would like to be added to our mailing list for more information on these new opportunities. This 10,000-square-foot permanent exhibit opened at the Museum of Science, Boston in November 2013, and now many of the 60 exhibit components are available for duplication and customization for your institution. The exhibit focuses on the ways physiological change affects individuals on a daily basis just as evolutionary change affects human populations over time. 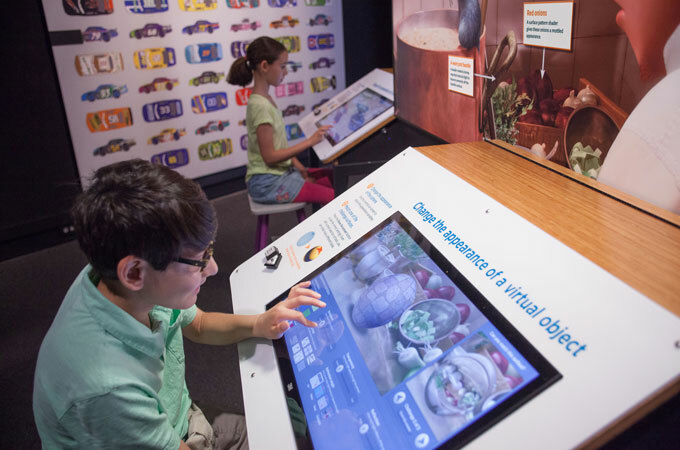 Visitors explore how food, physical forces, non-human organisms, social interaction, and time can change us, how we affect or change these factors, and how those changes can impact the future of our species. Using state-of-the-art technology, visitors can track their progress anonymously at 15 different stations with a barcoded wristband, measuring how their biology responds to dynamic environments and then making comparisons with the larger population, as data is assimilated and analyzed. The Museum of Science’s Design Challenges program introduces young learners to the engineering design cycle. Through a series of activities, participants are challenged to think like an engineer while they exercise their creativity to construct, test, and improve their prototypes to reach a specified goal. Design Challenges stimulates participants’ interest in making and understanding how things work, and in the role creativity plays in arriving at solutions to problems both great and small. We are now pleased to present three of our most popular Design Challenges activities: Soaring Satellites , Bobsled Racer , and Create-a-Claw – available for purchase by your institution! New presentations, programs, shows, and interactive exhibits are under constant development by our team of Museum educators. Our most popular offerings include our own Museum-produced Planetarium shows, which provide immersive deep-space fulldome theater experiences for audiences of all ages. We also license the use of many of our public programs and science theater presentations. Join the hunt for new worlds like our own! Undiscovered Worlds explores a timeless question: do other planets like Earth exist? Travel to distant stars and fly up close to exotic planets. Experience the science that may shift perspectives on humanity's place in the cosmos. 24- and 30-minute versions are available. Co-written with Alan Lightman, this show features an original orchestral score. Produced by the Museum of Science, this Planetarium show won Best Immersive Fulldome Program at the 2012 Jackson Hole Science Media Awards. Take a journey through our solar system and explore the remarkable diversity and surprising power of moons! Visit the far side of our own Moon, explore lakes of liquid methane and mountainous cliffs on Saturn’s Titan, and discover the turbulent volcanoes of Jupiter’s Io. Moons: Worlds of Mystery reveals how moons form, how they continue to change, and how they play a crucial role in the ongoing evolution of our solar system. 24- and 35-minute versions are available. Narrated by Ed Helms. Written and produced by the Museum of Science, this Planetarium show was nominated for Best Immersive Fulldome Program at the 2013 Jackson Hole Science Media Awards. For further information, please contact educationenterprises@mos.org. Past traveling exhibits include our blockbuster Star Wars®: Where Science Meets Imagination . More information about this exhibit can be found here.